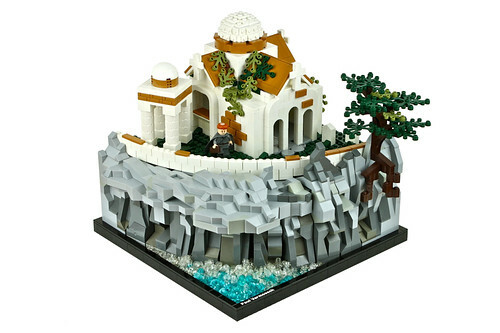 Brick Town Talk: Hermit Habitats - LEGO Town, Architecture, Building Tips, Inspiration Ideas, and more! Chastity Cliff - (BTT) It's one thing to want to get away from it all and find a nice little place to yourself by the sea to unwind as a vacation - it's another thing to make it your life. Further from society but closer to his creator, this lonely monk has just the sounds of the ocean below to keep him company. Fortunately, he also has a humble abode that might be small in footprint but is big on details. The clean, white stucco walls give a nice contrast to the surrounding landscape and provides the perfect blank backdrop for a lifetime of meditation.